(1924 ~ 1997) American author, poet ~ a condensed biography. Thus, it was in the psychedelic maelstrom, in the midst of San Francisco’s Haight-Ashbury turmoil at the start of the Seventies, that Thaddeus Golas achieved recognition as a major philosopher. He stood on street corners with his third wife Nancy Monroe, come rain or come shine, selling copies to passersby to make ends meet. The Lazy Man’s Guide to Enlightenment caught-on like wild fire, and Golas, the reluctant guru, became a bit of a sensation. His book remained in print for nearly 30 years. Often shunned by members of the New Age community for his biting criticism of their manipulations, Thaddeus Golas remained a nomad and led a discreet life, declining to lecture or exploit his readers with seminars. [*NEW!] Read the article “Revisiting Thaddeus Golas” posted on the blog Pocket Metaphysics, for an in depth look at the author and his concepts. 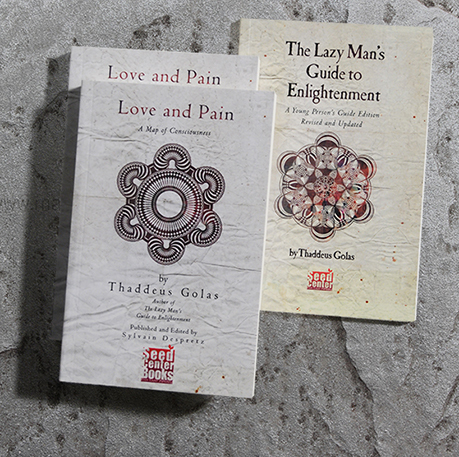 Twenty years after it was completed, Love and Pain, the second book by Thaddeus Golas, picks up where The Lazy Man’s Guide to Enlightenment leaves off. It is a deeper investigation of his metaphysical message; a more modern and more complete look at his cosmic map — by some accounts his “masterpiece” ! Similarly, The Cosmic Airdrome, his third book, is a whimsical, light-hearted collection of aphorisms and poems; a great companion to The Guide. The Lazy Man’s Life is the long awaited autobiography of Thaddeus Golas. Visit the official Thaddeus Golas website for more information, and unpublished writing samples. A comprehensive and factual look at Thaddeus Golas, and his life. Thaddeus Golas is generally known for having written The Lazy Man’s Guide to Enlightenment, a work widely recognized as a classic book on human consciousness and spirituality. The book was first published in 1972 by J.E. Casey of San Francisco. The Guide, as it is affectionately called by those who have read it, is thought by many to be one of the very best descriptions of, as well as a trigger for, the transcendental experience. 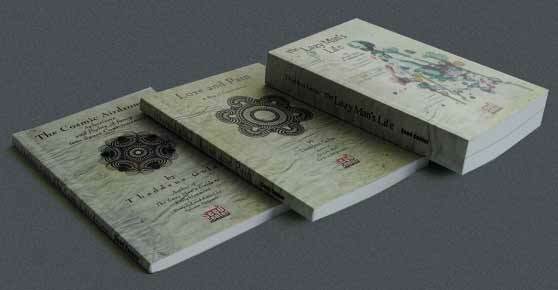 It has been described many times as “The last book you’ll ever need to read on Spirituality”. Thaddeus Stanley Golas was born on June 15, 1924 in Paterson, New Jersey. He was the youngest of five siblings, with four sisters. Both his parents were Polish immigrants who met in the United States. His father died when Thaddeus was four, and his mother later remarried when he was ten, but his stepfather later died of Tuberculosis. Before becoming a notorious 1960s dropout, Thaddeus Golas was a Columbia University graduate and a WWII veteran, who worked several jobs in the field of publishing. He married 3 times, and throughout his life, resided in Paterson, NJ, New York City, Norman, OK, Lawrence, KS, San Francisco, Hollywood, Malibu, Rohnert Park, and Redway, CA, and Sarasota, FL — his last stop. Thaddeus volunteered for military service in late 1942 and was made a Corporal in the 604th Engineer Camouflage Battalion billeted at Camp Campbell (now Fort Campbell) in Kentucky. He shipped off to Cardiff, Wales, was stationed in England until August 1944, then in France and Belgium, where he served until December 1944, when he was sent home suddenly, in the days preceding the Battle of the Bulge. Golas never saw any direct combat. On a “New Deal” scholarship, he eventually attended New York’s Columbia University where he studied under such illustrious professors as Jacques Barzun, and earned his B.A. Degree (Class of ’48,) in general humanities. He first worked as a proofreader for small newspapers in the New York metropolitan area, then for publisher Betty Ballantine, became a copy editor for Redbook Magazine, and worked at Harper & Row as a traveling book representative while living in the Midwest. After his second divorce, he finally moved to San Francisco, experimented with LSD, and self published his book, The Lazy Man’s Guide to Enlightenment. 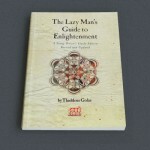 The Lazy Man’s Guide to Enlightenment is Thaddeus Golas’s first and most widely known book. It was self-published and handed out as a pamphlet edition but was quickly picked up by a San Francisco based Joe E. Casey, then, following a conflict with Casey, was salvaged by the Seed Center, a back room of Palo Alto’s Plowshare Bookstore, and in 1979, eventually wound up at Bantam Books (a company created by Betty Ballantine), where it remained in publication until 1993. Golas’s perhaps most famous piece of writing went utterly uncredited: In the 1950s, The Village Voice had begun publishing listings for New Yorkers seeking romantic partnerships. Thaddeus, then an occasional contributor to the weekly, wrote their first funny personal ad, cynically advertising his availability as a young divorcee, and mocking the mindless romantic yearnings of typical personal ads, thus starting a trend that continues to this day. The anonymous ad landed him a new wife and was quoted for years in many travel guides to the East Village, especially by John Wilcock in his hard-cover anthology. Golas, originally a poet, published a literary piece in Columbia University’s The Columbia Review, which he titled “Ugly Ugly vs Pure Pure” in the spring of 1947. He also published a couple of cultural reviews in the Village Voice, in the 1950s, and later, under assumed names in the San Francisco Chronicle during the 1970s. A handful of articles and interviews first published in the German language by Sphinx, a magazine based in Basel, Switzerland, later appeared in American monthlies ( 80s and 90s ) such as “Blotter”, “Spirit Magazine,” and “Sun Magazine”. Publishing these ideas proved impossible for two decades, and outright contempt from his publishers over his later manuscripts led to the end of his contract at Bantam. At the core of the book is this axiom: “We are equal beings, and the universe is our relations with each other.” However, behind the apparent casual language, Golas introduced powerful and complex ideas. Thaddeus Golas’s work is original, and amounts to a sort of metaphysical String Theory. It is unique in that it identifies a credible bridge between Science and Spirituality. His philosophy operates like a piece of software that unifies all beliefs, religious systems, scientific models, and can even integrate or at least help to grasp how nihilistic views can cohabit with exalted spiritual insights. Golas favored a spirituality inspired by Quantum Physics, General Relativity, and later Chaos Theory. His chief interest was in mapping the mechanisms of Space, Energy, and Mass, and how they relate to the human experience of consciousness, through a process of expansion to space, or contraction from space through energy into mass. “Basic entities are conscious space when expanded, unconscious mass when contracted, and alternating between these states as energy,” he noted. 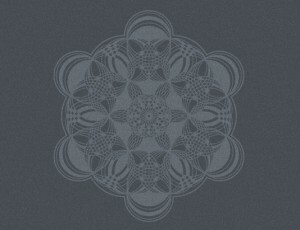 He described: “There are two states of being: expanded and contracted. (It might be more precise to say standing momentum outward, and standing momentum inward, but those are awkward phrases to repeat often.) An entity must be in one state or the other at any given instant. It may sustain either state at will. Expanding consciousness is not a process of expanding like a balloon, it is a process of PROLONGING your conscious state. You must be either conscious or unconscious in any given instant”. “Energy is the rapid alternation between space and mass”, he explained, “the devil, the delinquent, the messenger who delivers only half the message, the marker of time.” He coined the notion that: Space propels energy, and energy compels matter — this process which is mostly described in studies of Electromagnetism and Gravity also relates, according to Golas, to the mechanism by which consciousness becomes entangled in the physical realm. Golas saw Enlightenment not as a benign form of therapy, but merely the way out of this reality. Golas was not fond of the New Age movement nor of the propensity of its parishioners for wanting to attain control of physical reality. Golas also said, “It isn’t as though our movement in this life is horizontal through time, since in a state of Space Consciousness, the time is always now; when we attain a state of Space, we merely wake up where we have been sleeping”. Thaddeus S. Golas (author) is often confused with Thaddeus A. Golas, the TV commercial actor and movie-extra, credited in the films Star Trek IV and Video Dead. Thaddeus Golas met Thaddeus Golas once, in 1979, and they subsequently agreed to forward each other’ s letters and phone calls. (More on this historic meeting of Golas & Golas appears in the “Gee-Whiz!“ section of the Thaddeus Golas Café.) The only connection Thaddeus Golas ever had to a movie was when the Bantam edition of The Guide appeared briefly (in the hands of a night watchman) in a small scene of the picture Fletch Lives, with Chevy Chase. Thaddeus served in Patton’s Third Army, as part of the 604th Camouflage Engineer Battalion; he had enlisted after the bombings of Pearl Harbor. As part of a camouflage unit, he did not see any combat during the nearly two years he spent in Europe. Once, a buzz-bomb struck his camp, but he narrowly escaped injury. A short time later, after he complained of exhaustion, Golas was transferred away from his battalion which was stationed in the Ardennes; he was eventually diagnosed with a form of shell-shock, a stress case, (later referred to as a form of PTSD) and denied a chance to rejoin his platoon. He was already being sent home by the time the hostilities erupted at the Bulge. 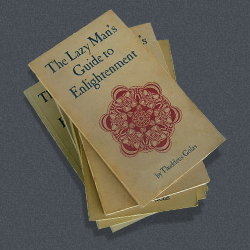 Thaddeus Golas completed The Lazy Man’s Guide to Enlightenment over a few weeks that followed months of personal turmoil in San Francisco, but the bulk of the text was composed and revised over a 20 year period, as an evolving manuscript which saw several earlier incarnations. Consequently, people who suggest that The Guide was channeled or came out of “automatic writing” sessions under an altered state are wrong. Thaddeus Golas was aware of this label on his work and often replied that he was not a “typist for higher consciousness,” but merely a poet and metaphysical writer who had tried his best to create a text with broad reach. Admittedly, some of the poetic vocabulary in The Guide was inspired by many “spaced-out” moments between 1968 and 1971, but this affected primarily Thaddeus’s choice to speak in a language useful to people in a state of confusion. His environment in the San Francisco commune “The Yellow Submarine”, a refuge for acid-heads, was a great testing ground for the effectiveness of this language. 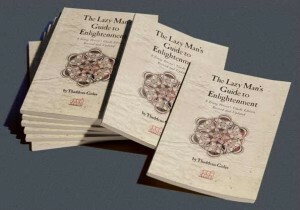 Over time, The Lazy Man’s Guide to Enlightenment came to be thought of as a “trip guide” but the book’s ultimate success stemmed from its appeal to people who had no connection to the Psychedelic Culture. 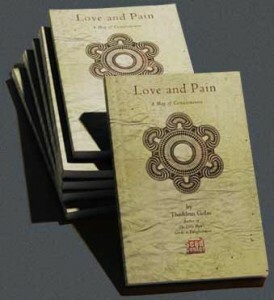 In later years, Thaddeus Golas set aside his interest in casting a wide net, and decided to refine his concepts unequivocally in his follow up book, the revolutionary Love and Pain. As a typist for conventional consciousness, Thaddeus Golas did work for Rosemary Leary, while husband Timothy Leary served time in jail; he helped type-up and transcribe the many cassettes which Timothy Leary had recorded as material for his books. Golas was also friends with actress Collin Wilcox-Paxton, of To Kill a Mockingbird fame, and was frequently asked to type-up scripts in development for some of Miss Wilcox’s showbiz acquaintances such as Jane Fonda. Thaddeus Golas went to High School with poet Allen Ginsberg and continued to ‘bump into him’ over a number of occasions; he observed that Ginsberg, who’d become a social activist, seemed embarrassed by Golas who presumably reminded him of his somewhat benign, middle-class Paterson, NJ origins, prior to Ginsberg crafting his ‘poet in revolt’ image. As a young poet, Ginsberg, for his part, had advised Golas to become more political, or miss out on a chance to connect with a wide audience. Thaddeus Golas was apolitical. He often stated he did not believe in a great conspiracy of managerial classes but rather, was interested in the conspiratorial failures of our own consciousness to attain freedom from physical reality. Thaddeus Golas, while he lived in New York, enjoyed a close friendship with avant-garde filmmaker Maya Deren; over the years, he caught the attention of contemporaries Timothy Leary and Alan Watts, though these two seemed to be primarily in awe of Thaddeus’s swift book sales. The Lazy Man’s Guide to Enlightenment was in print continuously for 40 years and translated into seven languages, but Golas felt it was only really well served by the English language. In later year, Golas restated his metaphysical message in Love and Pain, in a language that he felt left no room for ambiguity. Judging by many of the letters he had received over time, Thaddeus Golas was worried that fans of The Guide often read in the book what they preferred and glossed over critical sections of his text. “You cannot do that with Love and Pain,” he said. Thaddeus was a Grateful Dead fan and attended many of their concerts back in the days. He was not a groupie, but did get picked-up by Jerry Garcia and Bob Weir while hitchhiking back to the city from a concert. Thaddeus, who briefly managed a Rock band in Northern California attended the December 6, 1969 Altamont Free Concert with Patrice Hanson, his girlfriend, but was overcome with the urge to leave early, barely missing the infamous tragic occurrence of that day. He had no religious affiliation, and reckoned that if he had, he would never have had the open mindedness to arrive at the concepts presented in The Lazy Man’s Guide to Enlightenment. Despite rumors to the contrary, Thaddeus Golas did not “retire comfortably” on his royalties after writing The Lazy Man’s Guide to Enlightenment. Rather, he struggled through many years of meager living while publishers politely refused to release any more of his manuscripts after they realized that his ideas criticized and exposed the manipulations of the New Age publishing industry. Golas died a rather poor person, considering his fame. 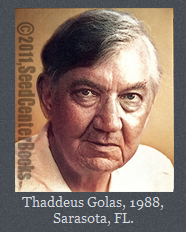 Thaddeus Golas who had developed cancer, died of complications from pneumonia, in Sarasota, FL, on April 16th, 1997. He was a heavy smoker all his life and credited smoking for getting him kicked-out of many groups he’d just as soon never be part of. He complained that living in California required far too much yielding to “correct attitudes” on a variety of subjects.